Pros - Great communication, good prices, good packing, high quality, healthy livestock. Cons - Joe is an Enabler. He enables one to expand their collection beyond the original plan. I happened to contact Joe shortly before he placed an order for import. This was to my advantage as there was a bigger list to choose from. Because the shipment was pending, I did not actually take delivery on my order for almost a month. (Also to my advantage as it gave me time to prepare.) Joe maintained excellent communication and kept me informed every step of the way. This, unfortunately for my pocketbook, allowed me to add on to my order. Upon arrival to Joe's, the one species I ordered came in as 4 juveniles versus 6 slings. This was beyond Joe's control, and the change was acceptable to me. Joe got my package out promptly and it was delivered just as a vicious nor'easter hit the east coast leaving me without power for three days. (Unpacking spiders by flashlight was a new experience...) All were well packaged, toasty and hit the substrate running. Included were two great freebies. Once I replenish the spider fund, I will definitely be ordering from Joe again. I highly recommend him. ETA: Joe shipped FedEx, Hold for Pickup. This was ideal due to both family and storm circumstances. Pros - Good communication and generous. We're both in southern CA and were about to work out a time to meet. I bought a couple non tarantulas that are not particularly common. He was certainly generous. I look forward to getting more spiders from him in the future. "Uncommon slings at reasonable prices!" Joe has a lot of slings that you don't see on every other dealer's list. They all arrived lively and in perfect condition. Sent a nice freebie too! Highly recommended. "Will definitely order from Joe again." Pros - Amazing variety, really exceptional communication, great packaging and insulation, very thoughtful about shipping method and weather reports. Cons - This isn't a con but a suggestion, and it may not be practicable, depending upon how fast his stock changes. It would be very nice to have a ballpark size on slings as part of their descriptions. However, when I inquired about this in preparation to receive my slings, Joe was very quick to let me know exactly what sizes to expect, and he was completely accurate. Joe was thoughtful and professional in his dealings with me, and he even donated a sling for a student science project. The slings arrived well protected and lively, exactly the size that Joe describe to me so that the habitats I prepared were correctly sized. This is a huge help. He also was extra diligent in terms of proper packaging for the weather the slings might be in countering in their travels, and he diligently followed their progress through the FedEx system until they arrived safely. I will definitely bring him my business again. Pros - Excellent communication, very friendly and amazing service. I purchased two tarantulas from Joe recently. This gentleman offers an incredible service to his clients. He is very quick to respond to messages and offer his advice. Unfortunately the package was delayed by the carrier and it arrived after expected. Sadly both Ts perished in transit. This was no fault of Joe! The Ts were packed perfectly with plenty of insulation, warmth, and safely tucked in their containers. I let Joe know about the situation and he quickly offered to send me replacements. They arrived today and I can happily report they made their journey safe! I am absolutely blown away the attention he provided and the incredible tarantulas! If you have been thinking about making a purchase, I highly recommend you buy from Joe! Cons - He doesn't live next store and I can't just walk over and buy from him... JK. No cons..
Bought a couple spiders and asked him to hold for a few days until the weather warmed up. He did with no questions asked. 1 of the spiders got stuck in a molt right before shipping and offered plenty of others to choose from to replace or a refund. I took the refund which I got in less then 5 minutes, and he was still awesome enough to throw in a freebie for what happened even though I only ended up buying 1 spider. I will buy from him again. Cons - Spiders died due to inadequate packaging. Not much to say. Out on a limb speaking against an old timer. Sure I'll get pasted. But I'm just being honest. Recently purchased 8 spiders from Joe at a cost of $450. 5 of the 8 arrived dead due to the most inadequate packaging I have ever received in over 20 online spider transactions. The 8 spiders were in a 3-1/2" square box with no heat pack. He got to claim void LAG due to FedEx being a little late although the dead spiders were crushed. Claimed he would toss in a few freebies on my next order. First time I ever received a dead spider. Sad. He has not made any attempt to replace the dead ones. Although the spiders were crushed he says it's FedEx fault. Beware. 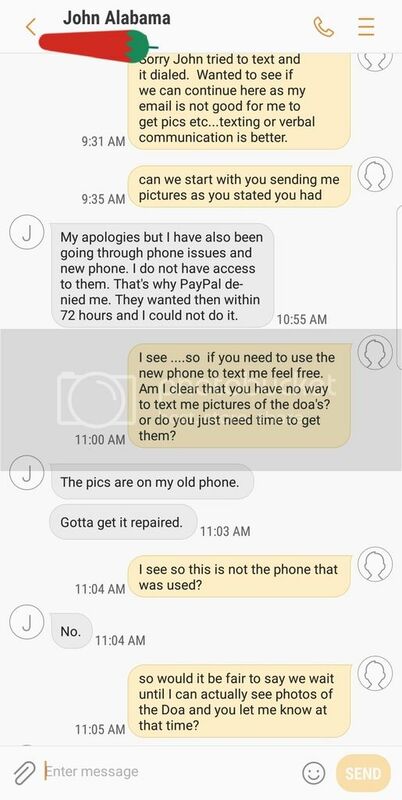 Seller Be Aware John will try and SCAM. Well folks I had been warned eventually after so many transactions I would run into an untrustworthy liar and here John is. 1. FedEx was late with the pack and LAG was voided. 2. Although FedEx was late I told John I would still work with him and replace spiders. 3. John agreed and said he would wait, but never provided a picture of any DOA. 4. John lied and with out warning filed a PayPal dispute for money back. 5. John lied on the PayPal dispute saying we never did any transaction on AB and only through Email. 6. John lost the PayPal dispute. 7. Although John lost I still offered to work with him if he provided a picture. 8. John said his pictures were all lost and to forget it and have a Merry Christmas. 9. John posts a negative review. John Hare (message chain herehttp://arachnoboards.com/conversations/friday-sale.260649/) contacted me on a sale. He went ahead and purchased about 8 spiders and as usual I sent the spiders out, but I noticed he dropped all communication here and would only email responses. Well FEDEX was late (1 day late) with the pack and the spiders sat overnight in a metal container. I felt all was packed well and told him not to worry all should be fine. After he received he emailed that 4 of the spiders looked dead and I told him to give me a call and lets talk about it as my email was acting funky. So the baffling part is he finally calls and I talk with him. He seems nice and genuine and I tell him although it is 100% not my fault because FEDEX was late and voided my LAG that I would still work with him and get him the spiders that he said died on his next order (he was talking about getting an immanis etc..). So first time ever I get a paypal claiming a refund and I was like w.t.f.. He threatened to leave a negative review every where, call the better business bureau, ruin me etc... I still dont even have a picture of any DOA! We did this deal on email. No mention of live arrival guarantee. I have the emails. I also have pictures of the box and boxes of other shippers i received from for a comparison. And the reason of this problem is inadequate packaging. I can clearly show you. Of all the transactions, all of which have been through PayPal and you can see there were many, this is my first ever issue. I also have pictures of other complaints against this seller for the same and similar issues. And the weather on 11-29- 2017 in Menifee Ca. Was a high of 75. Low of 46. The package according to the shipping left after dark when it was well below the 75 and dropping. Joe told me later he didn't use heat pack because it was 90 degrees. He just screwed up and don't thinks it should fall on the customer. John begins his response with a lie stating we did this deal by email. I have proof that John initiated the deal on the arachnoboard forum here http://arachnoboards.com/conversations/friday-sale.260649/ titled” Friday Deal” (If the link does not work because of log in privledges then I can offer screen shots.) Again temperatures 75-80 degrees are a risk with a heat pack and can cause excessive heat to the tarantula. The pack was shipped and dropped off in the afternoon even if FEDEX did not scan until later afternoon so the pack was being processed during those temperatures. Again I offered to replace the spiders for John even though I was not 100% responsible due to FEDEX being late as they kept the pack in a metal outside container in Alabama overnight and he originally accepted. He stated he was looking at other spiders, possibly X. Immanis, and I said I would let him know as soon as I have stock as long as he stayed in good honest communication. At this point with John's fabrication and refusal to communicate via text or phone I question his character or if he ever want to work any thing out. I also still have no photos even if he does have them of the DOA's and certainly not in 24hrs at that was voided in the LAG terms already discussed. FEDEX just screwed up being late and instead of John being honest and communicating to get replacements he made a poor choice to try and take advantage of a very honest person. "Absolutely hands down best I've seen in fifteen y"
Wow I am speachless this guy is an absolute pro PERIOD.I highly recommend buying from Joe super fantastic guy a true gem to the entire hobbie above and beyond perfect.